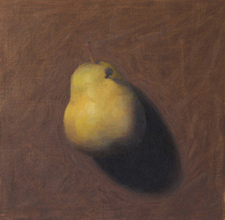 Painting fruit is a time-honored tradition, so it seemed a good place to start for a smaller study. In lieu of an actual pear, I used an artificial stand-in that looked fairly close to the real thing. Although I had suspended the faux fruit by a wire, I drove a nail through the plastic prop to give the appearance of being pinned to the wall. Under the bright spot light, the subtle forms were a fun challenge to capture.